. :: Elica Editions ::: Dedalus ::. 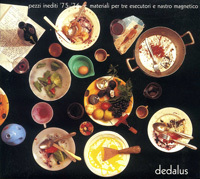 Hailed in the early seventies as the best Italian group of 'avant-garde' jazz rock along with Area and Perigeo, in the mid-seventies, with the release of their second album, Dedalus started a much more uncompromisingly experimental approach to music through the use and combination of disparate musical materials: improvisation, electronic music and musique concrète techniques, elements of contemporary classical composition, folk tunes, jazz, use of self-built and modified instruments for research on timbre, etc., with much conviction and totally unique and beautiful results. This disc re-issues their very hard-to-find second album, Materiali per tre esecutori e mastro magnetico with the addition of about 40 minutes of material recorded in the year following the release of the album, most of which was produced specifically for a record to be released on Cramps Records' historical DIVerso series which remained unreleased because of the label's discontinuance. Most of the material was recorded by the trio composed of Fiorenzo Michele Bonansone (cello, piano, Fender piano, voice, accordion, synthesizer, soprano ocarina, electrified mandolin, "plastubofono", bottles), Marco di Castri (tenor and soprano saxophones, electric, acoustic, prepared or bending guitars, harmonica, flute, Moroccan oboe, pipe with reed) and Enrico Grosso (drums, percussion and noises) - with the help of Ennio Bonansone as sound engineer on the pieces from the album - and part as a duet by Fiorenzo Michele Bonansone and Marco Di Castri. Digi-pack type cover with 12-page insert containing texts in Italian and English (original notes and detailed group chronology) and photographs.